In October 1937, the FBI’s public enemy number one – bankrobber and murderer Al Brady – came to Bangor, Maine, with his Brady Gang. He thought for sure he could blend in as an out-of-state sportsman and buy some guns. Was he ever wrong. FBI mugshots of the Brady Gang. 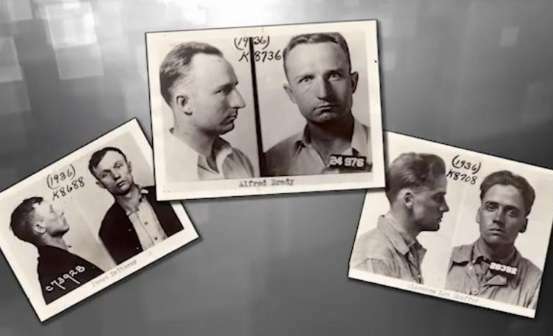 Al Brady, James Dalhover and Clarence Shaffer collectively made up the Brady Gang, and they had a long history of robbing banks. The gang’s final, violent spree began in October 1936. They killed an Indiana police officer after a jewelry store robbery. Then, after their arrest, they escaped from the county jail in Indianapolis. This escape, and evidence that they had taken stolen jewelry across state lines, put the Brady Gang in the crosshairs of the FBI, which named Al Brady number one on its most wanted list. Shaffer was second. The three men knew their escape would prompt an enormous manhunt, so they hit on a plan to move to Baltimore. Here they blended in with the local community. Dalhover and Shaffer even married (despite the fact one already had a wife and children). When money ran low, the three would steal a car and travel to their Midwest stomping grounds. There they robbed banks and stores to keep them in cash. Then they would return quietly to Baltimore, leaving federal agents and police searching Indianapolis, Ohio and Illinois – baffled that the Brady Gang had managed to vanish into thin air. Meanwhile, the men told their friends and families in Baltimore that they were travelling furniture salesmen working for a company in Bangor, Maine. The ruse worked for almost a year, but the FBI busily spread the word about the gang, showing their pictures on wanted posters and in movie newsreels. Eventually, police discovered the Brady Gang in Baltimore. They tried to corner the gang, but in a wild shootout they managed to escape the city. With their cover blown in Baltimore, the gang next moved to Bridgeport, Conn. The men had an obsession with adding to their arsenal. They had two old machine guns they stole from American Legion Hall displays in the Midwest, but their goal was to acquire more. In Bridgeport they hoped to make acquaintance with someone working at the Colt factory and find a way to get weapons from there. In September 1937, the gang decided a hunting trip to Maine was in order – a vacation of sorts. Brady and Shaffer wanted to go, Dalhover voted no, but the majority ruled. One of the gang had heard that Maine was an easy place to buy guns – no questions asked. Working their way up through Augusta, they got a referral from a hardware store that they should try Dakin’s Sporting Goods in Bangor if they were looking for guns. On September 21, the men went to Dakin’s. They bought two .45 caliber pistols and extra clips. On Oct. 5, 1937, they returned and bought another pistol and a rifle. In addition, they asked if the store could procure a machine gun for them. Their cover story as hunters was wearing thin at this point. The men were getting known around town as good tippers and their car, with Ohio plates, was very conspicuous. A clerk at Dakin’s took his suspicions to the local police and the state police. From there, the word went to the FBI that a suspicious gang was circulating in out-of-the-way Bangor. The FBI sent an agent to Bangor with mug shots and he found witnesses who told him yes, indeed, the men were the Brady Gang. The clerk at Dakin’s told him the last time he spoke with one of the Brady Gang, he asked about the machine gun and the extra weapons magazines they wanted. Check back in a few days, he was told. That set the stage for the final confrontation. On October 12 at 8:30 in the morning, Dalhover returned to the store to inquire about the guns. Inside was Walter Walsh, an FBI agent, posing as a store clerk. Before Dalhover could react, Walsh had him in handcuffs. But no sooner did the special agent ask where his gangster pals were than Shaffer began shooting from the doorway to the store. Shaffer had stationed himself as a lookout on the street. Brady had stayed in the car in front of the store. Walsh was hit, but he still managed to return fire at Shaffer, who was running toward the car. With police and FBI surrounding the car, Shaffer was killed in less than a minute. When police recovered his gun, they found he hadn’t even managed to empty it in the shootout. With Brady still in the car, the FBI told him to surrender. "Don’t shoot," he hollered, and began to get out of the vehicle. But instead of surrendering he pulled out a gun and began firing. It was the last thing he would ever do. With dozens of police training their weapons on him, he didn’t stand a chance. Public enemy number one died in the middle of Central Street in Bangor. The news that he had been killed traveled like wildfire. The two men’s wives in Baltimore cheered that the scoundrels had been killed, and Dalhover’s mother told reporters she wished he had died with the others. Instead, he was shipped to Indiana, tried and executed. Walter Walsh recovered from his wounds. He would go on to be a sharpshooter in World War II and something of an FBI legend. Shaffer’s family sent for his body and had him returned to Indiana for burial. No one wanted Brady’s remains. He’s buried today in Bangor, where his bloody career came to an end. This story about the Brady Gang was updated in 2018.